Annual conference at the Southwest College of Naturopathic Medicine in Tempe, Arizona. Topics include influenza, common infections in women, hyperlipidemia, sleep disorders, regulation for detoxification, silica, and much more. 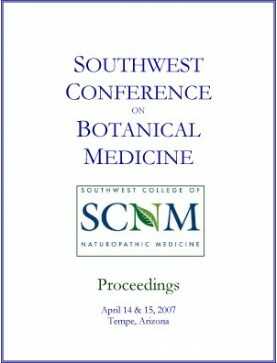 2007 Southwest Conference on Botanical Medicine: Conference Book. Order download of PDF f..
Full Set of Southwest Conference on Botanical Medicines: MP3 recordings includes these titles (..
Speaker: Michael Moore. Although we have nothing compared to the hardwood forests of the east, there..
Speaker: Mark Blumenthal. An update on latest clinical studies documenting the safety and efficacy o..
Speaker: Mimi Kamp. Flower essences are a graceful, effective, and never contraindicated adjunct to ..
Speaker: Rhonda PallasDowney. Herbal medicine, homeopathy, and the use of flower essences exist on a..